Is the Model UN a CIA Propaganda Tool? Posted on October 13, 2017	by Blowhard, Esq. Yes, I’m talking about the high school extracurricular activity but waitasecond, hear me out before you click over to the most recent Naked Lady of the Week. The GF and I were working our way through PARKS & RECREATION (funny show!) when we got to an episode that takes place during a high school Model United Nations conference. I started thinking about the Model UN and what an odd program it is. Kids pretending to be diplomatic delegates, negotiating in committees, and studying parliamentary procedure? Sure, I guess, but the whole thing strikes me as more than a little weird considering that 0.00001% of the population becomes a professional diplomat. “Yes, but the Model UN prepares them for the business world generally!” you may say. To which I respond, “Then why not just have a club where kids start their own business?” Anyway, maybe I’ve been in an unusually conspiratorial cast of mind lately, but I started wondering if the Model UN isn’t some kind of government psyops program. We know that the CIA funded cultural weapons like modern art and The Paris Review, so is it really that big of a leap to believe that they funded (or otherwise encouraged) something to brainwash, er, educate, our future leaders? Off to Wikipedia! The first Model United Nations was held at St. Lawrence University from February 11–13, 1949. It was initiated by Dr. Harry Reiff, Head of the History and Government Department, with the assistance of departmental colleague Otto L. George. Dr. Reiff was a technical advisor on the United States delegation to the 1945 San Francisco Conference (where the UN Charter was written) and the UN Organizational Conference in London in 1945-46 (where the UN was established). First step was to look up Dr. Harry Reiff of St. Lawrence University. The most substantive thing I could find was a FB post about a self-published biography written by his son. Maybe the book reveals that Dr. Reiff was actually Wild Bill Donovan’s right-hand man codenamed “Jason Bourne,” but I wasn’t about to order it to find out. So what about Otto L. George? WELL WELL WELL — WHAT DO WE HAVE HERE? Otto L. George, 66, a senior intelligence officer and Asian analyst and editor with the CIA for 23 years before retiring in 1976, died of a heart ailment May 12 in a hospital in Leesburg. He had lived in Leesburg since 1980. Mr. George was born in Dunellen, N.J., and reared in White Plains, N.Y. He earned bachelor’s and master’s degrees at Columbia University, and taught Asian history at St. Lawrence University in Canton, N.Y. He served as a Japanese language officer with the Navy in the Pacific during World War II, and joined the Navy reserves after the war. He was recalled to active duty during the Korean conflict, serving as an intelligence officer at the Pacific Fleet headquarters at Pearl Harbor. He retired from the service in 1953. Mr. George moved to Washington in 1953 when he joined the CIA. He received the CIA’s Certificate of Distinction in 1976. But not so fast, a quick check of the dates shows the timing is off. The United Nations was founded in 1945 while the CIA was founded in 1947. The first Model UN meeting was held in 1949 and George didn’t join the CIA until 1953, four years later. However, George was an intelligence officer during WWII through the Korean War, so it’s reasonable to assume he had intelligence (OWI? OSS? CIA?) contacts from 1945 to 1953. Might the government have funneled money through George? Seems possible. Hard to know how likely without knowing more details. Look, I may be crazy, but I’m not stupid. I realize this is all insinuation and speculation that doesn’t prove anything. Still, it strikes me as an interesting, nontrivial connection worth investigating further. Not that I have any intention of doing so. In the meantime, allow me to recommend a movie. 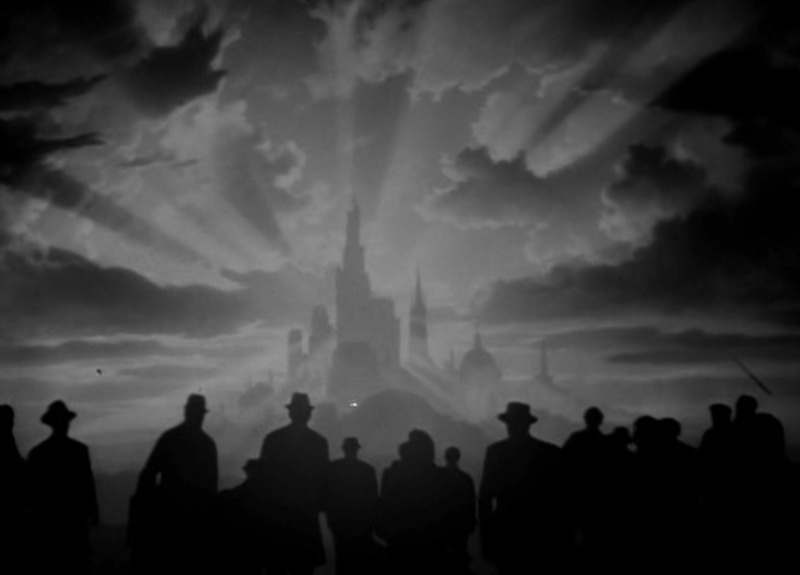 It’s a 1943 picture called MISSION TO MOSCOW, written by Howard Koch, directed by Michael Curtiz, and produced by Warner Bros, the same creative team that gave us CASABLANCA. In fact, MTM was their immediate follow-up to CASABLANCA. The movie is a slog, but it’s also the most jaw-dropping piece of pro-Soviet propaganda you’ve ever seen in your life. Toward the end, our hero, the U.S.’s ambassador to Russia played by Walter Huston, meets kindly Uncle Joe who, along with the spirit of Uncle Karl, explains what great friends the U.S. and Soviets are. It ends with a rousing vision of the future, the United States and Soviet Union creating the fabled City on the Hill after defeating the dastardly Germans. The film was the first pro-Soviet Hollywood film of its time and was followed by others, including Samuel Goldwyn‘s The North Star (1943), MGM’s Song of Russia (1944), United Artists’ Three Russian Girls (1943), Columbia’s The Boy from Stalingrad (1943) and Counter-Attack (1945). Roosevelt himself approved the creation of the film, even meeting with Davies several times (July, October, and November 1942 and March 1943) during the film’s production to discuss its progress. As part of his contract with Warner Bros., Davies had absolute control over the script and could veto any dialogue not to his liking. During production, Office of War Information officials reviewed screenplay revisions and prints of the film and commented on them. By reviewing the scripts and prints, OWI officials exercised authority over Mission to Moscow, ensuring that it promoted the “United Nations” theme. [emphasis mine] An administration official advised the film’s producers to offer explanations for the Nazi-Soviet Pact and the Red Army’s invasion of Finland. After reading the final script, in November 1942 the OWI expressed its hope that Mission to Moscow would “make one of the most remarkable pictures of this war” and “a very great contribution to the war information program”. Government information specialists were equally enthusiastic about the completed print. Judging it “a magnificent contribution” to wartime propaganda, the OWI believed the picture would “do much to bring understanding of Soviet international policy in the past years and dispel the fears which many honest persons have felt with regard to our alliance with Russia”. That was particularly so since “the possibility for the friendly alliance of the Capitalist United States and the Socialist Russia is shown to be firmly rooted in the mutual desire for peace of the two great countries”. Prior to its Russian release, the film was screened for Joseph Stalin at a banquet at the Kremlin attended by Joseph Davies and the British legation in Moscow. Called to testify under oath before Congress, Jack L. Warner at first claimed that the film was made at the request of Davies, who with the approval of FDR had asked Warner Bros. to make the film (this version of the facts was confirmed by Davies’ letter as well). Warner later recanted this version, stating that Harry Warner first read Mission to Moscow and then contacted Davies to discuss movie rights. Probably my favorite detail in the movie is that, while Stalin and Churchill are played by actors, an actor plays FDR’s voice only but we never see his face. God forbid anyone should try to portray his sacred image. There was a time when people thought the American and Soviet systems were converging. This entry was posted in History, Movies, Politics and Economics and tagged conspiracy theories, Franklin Delano Roosevelt, Howard Koch, Jack Warner, Joseph Stalin, Michael Curtiz, tinfoil hattery, United Nations. Bookmark the permalink. 6 Responses to Is the Model UN a CIA Propaganda Tool? Same thing in “Yankee Doodle Dandy” when Cohan / Cagney visits FDR in the White House. And just like the Deep State is in bed with both public education and Hollywood (and nobody can tell me that ‘American Ultra‘ wasn’t pro-CIA agitprop for leftist stoners), Big ‘Defense’ is in bed with the entertainment industry, as much as they can get away with, though people are beginning to notice. Good old Foseti. What ever happened to that guy?